The Hanoi Summit is now in the hands of the South Korean Left. It is a strained mental image: Kim Jong-un slowly rattling his way back to Pyongyang, through the eastern heights of Chinese industrialisation; from light to dark. The smatterings of information, second-hand reports and occasional image of Kim smoking on a platform, becoming less-and-less frequent, and reliable, as the sixty hour journey moved further away from Hanoi, then disappearing completely across the Yalu River into North Korea. The sense outside of Kim’s bubble was one of defeat and miscalculation. He overplayed his hand, asked for too much, and stood too strongly over his convictions. Inside the bubble, things would have been different. The only people paying any real attention to Kim – or indeed North Korea – during that leisurely train ride are called – and call themselves – ‘Pyongyang Watchers’. It is a strained piece of language, and one I have never liked, but it does speak to the nature of North Korean studies (or what often passes for North Korean studies) in many academic circles. These Watchers, with the world’s spotlight shifting elsewhere, are soon back to the grind of their daily work: picking through satellite images, market prices, imports and exports, and the presence – or absence – of regime members in official media broadcasts. From this, infer away! Try to divine intentions, new policies and indeed, national sentiment. What you get are plausible, yet nearly completely unfounded claims, about the internal cogs grinding away north of the DMZ. A much more solid science is that which runs the other way, and which no-one seems to give much heed to. If the world is full of Pyongyang Watchers, then Pyongyang is also full of Seoul Watchers. Not Washington Watchers, London Watchers, Berlin, Moscow, or even Beijing. Kim’s game is the same one that his grandfather, Kim Il-sung, and father, Kim Jong-il, were committed to playing. And it has nothing to do with joining the nuclear club, self-defence or even sanctions relief (which is, of course, derivative of the first two). It is often by taking Pyongyang at their word, that we get our talking points about a nuclear deterrent and a country fearful of attack. And a Libyan Model/Fear of disarmament, collapse, invasion and presidential assassination. The trouble is, North Korea have never behaved like an externally insecure regime; just the opposite in fact. Only one of the Koreas has ever had to fight off military incursions, political killings, terrorism, and full scale war from the other. Besides, what type of nervous, fearful regime spends its time in bellicose threats and intimidation towards the world’s most powerful military? Or indeed, doing the one thing that has been a redline for conflict and intervention elsewhere: the construction of a nuclear arsenal. If nuclear weapons and the accompanying missile technology were the only thing capable of holding back an American attack, then the corollary must run that America would never have let them achieve it. That Pyongyang’s slow-motion nuclear build-up escaped a surgical strike or two along the way, is all the proof needed that North Korea’s conventional forces were always deterrent enough. Which brings us back to the Hanoi Summit, and the question of what this is all about. Decades of long-term internal propaganda (intended for North Korean ears only), stretching back to the founding of the state under Kim Il-sung, gives a very clear answer. It is, and always has been, all about South Korea. The ‘victory’ connotation is important. It fits with Songun (North Korea’s ‘Military First’ policy), and should (but never does) echo as a permanent threat to the South Korean republic. Kim’s reunification is reunification under the Northern flag – the consumption of one state by another. North Korea will continue, enlarged and stronger; South Korea the necessary sacrifice. It is here, and only here, that America is of any interest. 20,000+ American troops stationed in South Korea represent a unique problem for Kim. Any Northern absorption will be in steps: confederation, deeper political integration, a greater will for the fight within the North Korean citizenry, and at some point – preferably early in the process – the removal of American troops. It is this hinge that the regime in Pyongyang are most concerned about, and rightly so. 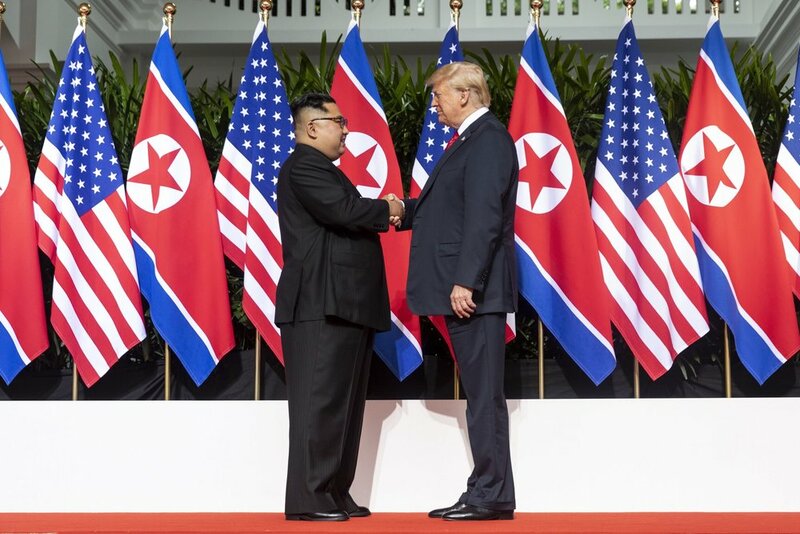 Edging the South toward capitulation is a lot more certain a proposition once they have first stepped away from their military and political alliances with America; a friendship consummated instantly with the American victory over Imperial Japan, which was in turn the liberation of Korea. The Americans stayed around, invested, defended, and became Seoul’s deepest military ally. So how, if you are Kim, do you break this marriage up? First you spend a year (2017) making sure that both countries are paying very close attention to how badly things could go. Despite the desire for reunification in South Korea, it is often muffled into silence by an understandable fatigue and related apathy. Nuclear tests and missile launches are enough to wake anyone up. Then you offer a rapidly escalating peace – an uncomfortably fast courtship. But coming out of the shadow of conflict, one that seems too good to ignore. You push for cooperation, the binding together of economies, policies and institutions; something Moon Jae-in and his government have been all too eager to commit to (trying to fulfil an election promise to complete the process before the end of his term). Pushing toward confederation at such an uninhibited speed, that extraordinarily the nuclear issue has fallen into the margins. Except for the Americans, for whom nuclear weaponry is still the looming concern, and the only reason for talking to Pyongyang at all. So Kim asks for something he knows Washington cannot reasonably agree to, both parties walk away, and Kim watches carefully for Seoul’s reaction. South Korea’s conservatives cheered Trump’s resolve, but they are a near irrelevant political voice these days, having still not recovered any sense of identity following the Park Geun-hye scandal. And elsewhere, Kim would have been happy. Boundless amounts of editorial space in leading newspapers were quick to accuse America of being too ‘negative’, ‘obstinate’ and ‘lacking consideration for the plight of the Korean people’. Then there were the voices of important public figures such as former Unification Minister Jeong Se-hyun, saying: "I believe the breakdown was intentionally brought about by the U.S. side”. The remedy: “An inter-Korean summit should be held”…“the government should move fast." Imagine the smile on Kim’s face: his battle being fought for him, and by none other than the people he intends to victimise next. Large-scale anti-Americanism of the past is unlikely to return. But those moments in history do offer a look into just how fragile the U.S.-South Korean alliance might be. The two most infamous cases involved the accusation that U.S troops deliberately ran down two school girls from their military transport, and that Korea was to become the dumping ground for diseased American beef. Both factually wrong, both formed with an obvious air of conspiratorial thinking, and yet both drawing large scale street protests. Taking the political wind inside South Korea, Kim Jong-un must be sensing his opportunity. A very real chance to convince his divided brothers and sisters that the only real barrier to peace and reunification is the American troop presence. A troop presence that Donald Trump has just strong-armed them into paying more to house and maintain. And if things begin to fall silent in Seoul, and if that fatigue begins to re-emerge, Kim only needs to fire up a missile site or two, and dust off a few launch pads. Reminding South Koreans how badly things could go if they don’t play their part in pushing for reunification of the peninsula; at all costs, and in a manner that the regime in Pyongyang approves of.